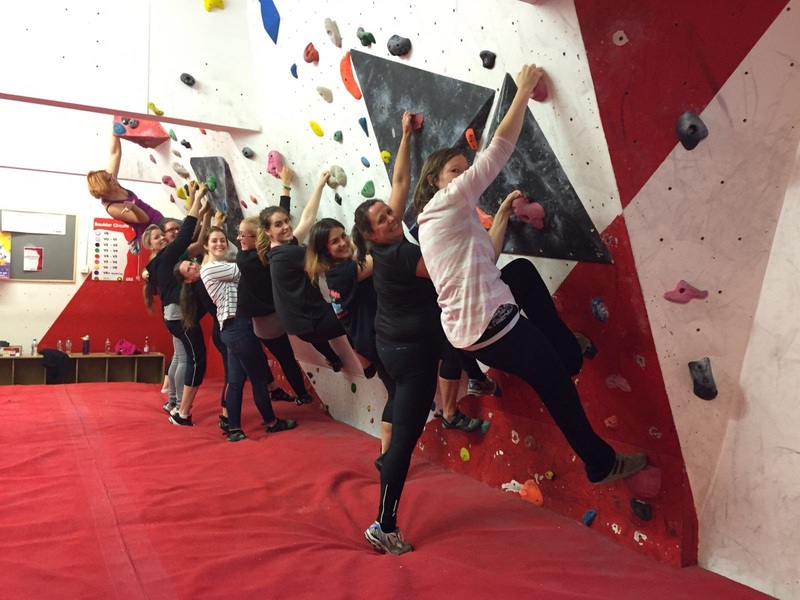 Last week I had the pleasure of attending my first ever climbing session by Women Climb, at Manchester Climb Centre, as part of the BMC Women Outdoors week. I did some rock climbing when I was about 12, but I was terrible at coming back down (I have vertigo and abseiling makes me cry), and since then, I’ve become a lot less active, flexible and generally much more clumsy. I was pretty sure I was going to be the worst climber there, but I was happy to go along, give it a go, and see what I could do. On arrival, we were split into four groups to take part in the activities, and my group headed off to start the evening with some bouldering. Bouldering is a form of climbing that does not use any ropes or harnesses. You don’t tend to climb super high, and there are crash mats below you to break your fall if you slip. I’m not very good at bouldering. Something about not having any sort of safety or support seemed to make my knees wobble despite my feet barely being three feet off the ground. It wasn’t the best start to my evening, and did make me wonder just how rubbish I would be when it came to actual climbing later on. It was nice to get chatting to some of the other ladies in my group, everyone was really supportive of each other, and it created a really nice overall atmosphere. Next we tried some traversing, (similar to bouldering, but going horizontally across a wall, while staying low to the ground) which I was also pretty awful at. I’m blaming my big feet, but lack of coordination and general clumsiness also played a part. After a some inspirational videos and a short break, my group had our turn at climbing. Once I was kitted out in my harness, we headed off to the smaller training walls to practice. I was most nervous about being paired up with someone who wouldn’t be able to hold my weight, but I teamed up with Rebecca who put me right at ease by telling me she belays for her 17 stone husband, so I felt much better about giving it a try. The walls have different coloured hand and foot grips up them, with each colour representing a different difficulty in route. Most girls started with the most easy of the routes, and began to work their way up. My tactic was to use any grip I could and to just see how high I could get! My first attempt I didn’t go too high up, as I was more concerned about practicing the coming down bit before I got too adventurous. Surprisingly I seemed much better at the up part once my harness was in place, the feeling of security must have given me more confidence, and I wasn’t too hesitant when starting off. Despite being nervous about coming back down, my fear appeared to cause me to overcompensate, and my ‘just do it’ attitude meant that I leant straight back, and came down with no trouble. In fact, I was told that my posture coming down was very good for a beginner as not many people can lean right back! My next attempt got be about half way up the wall, and my final try I was happy when I managed to just get a little bit further than the previous attempt. When we finished on the training wall, I had climbed around 12 feet off the ground. Next we moved to a larger wall, and although I was pretty sure I would never make it to the top, I was excited to give it a go and see how far I could get. After a couple of attempts, I reached a height of around 16 feet, which was way more than I ever imagined I would do. I even attempted the more difficult side of the wall, which I was pretty terrible at, but my instructor Chi was amazing and trying to help me get as far as I could, and the support from the other girls in my groups was amazing. Many of the girls made it to the top of the wall, and some who had been climbing for a few months even managed personal bests by climbing routes more difficult than they had managed before. There was a great atmosphere in the group by the time we finished, and even though I made the worst overall progress up the wall, I had some huge personal achievements, and I’m really glad that I gave it a go. It was an amazing evening, and we even got sent home with goodie bags, courtesy of sponsors BMC, Brain Feed and Cold Brew. In fact, I had so much fun, that I signed myself and my other half up for a beginner’s course! After three weekly sessions, we’ll be signed off as independent climbers and can go together whenever we like. Since my first experience I have ached in places I didn’t know I had, and spent each morning counting the new bruises that keep popping up, but I’m still really excited about giving the beginner’s course a go, and will update you all soon! This looks very fun and I’ve got a friend who was really into climbing when she was younger who highly recommends it but I don’t think I’d like coming back down!